NAPA, Calif. — It's been six days since wildfires first tore through California's wine country, and flames still slither past both sides of Mount Veeder Road — devouring dry grass, trees and power poles. The road is closed — barricaded miles back by police. But none of that stops Jimmy Hayes or his crew from Mayacamas Vineyard from completing their task. Carcasses of fallen trees and electric lines block this scraggly artery, which winds from the town of Glen Ellen to Napa, as hot orange flames belch clouds of fragrant smoke. Where the fire has already burned, the hills are covered in white ash like fallen snow. "We want to be here as much as possible right now, even though it's a little bit treacherous," said Jimmy Hayes, Mayacamas' estate director. "We have work to do on the wine. "This is the middle of harvest, which is the busiest time of year and the last time you'd ever want something like this to happen," he said, standing in front of what used to be the tasting room and hospitality hub. The facility was built as a distillery in 1889, but now only half the first floor's stone walls remain. The rest of the building — including a kitchen and an upstairs residence — was reduced to a foot-deep layer of ash. The hospitality center, called "the residence," was used to host guests and store many prized library wines — all of which melted into their shelves. "We've lost a lot. But we actually held on to a lot of the most important things throughout this process," he said, referring to the property's iconic stone winery, also built in 1889, which cellars many barrels of Mayacamas wine. And it's those barrels that Hayes and his crew have come to tend. While they had already harvested all their grapes, juice from one fermentation tank must be drained to another — something usually done with an electric pump. But with the property smoldering and power lines down, water and electricity are out of the question. "We are usually taking care of these wines with our hands all day, every day, and we've basically been out of town for five days," Hayes said, saying they'll be forced to use gravity and hoses to move the juice without power. "So we've got to really be sure that the wines are stable and sound, and that's what we're doing right now," he said as his colleague opened a fermentation tank with just the dim light of his headlamp. According to latest estimates, Sonoma County has suffered $3 billion in losses to the fires. 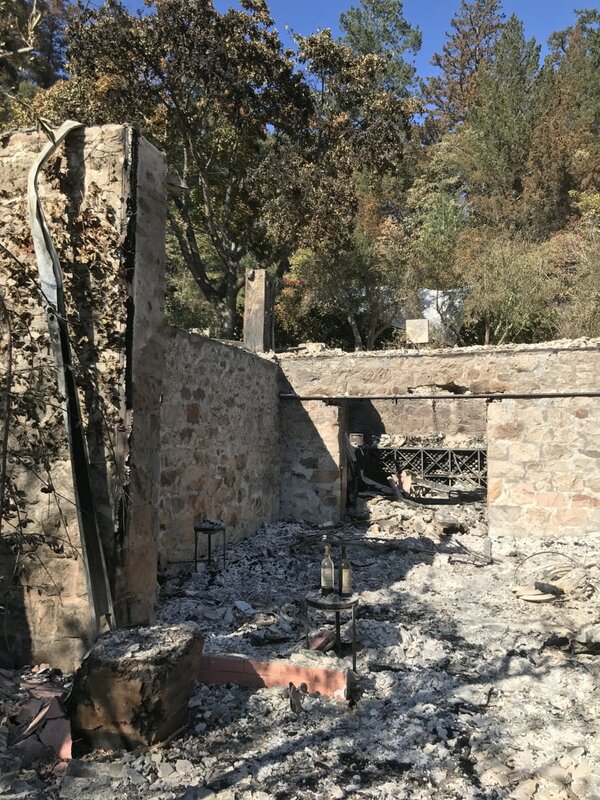 At least 20 wineries in Napa sustained damage to their winery, outbuildings or vineyards, according to Napa Valley Vintners, the region's trade association. With evacuation orders still in place, many are just now assessing the damage. And for those wineries with grapes yet to pick, the biggest concern is "smoke taint" — smoke residue that can accumulate in grape skins and pulp. Enterprise Vineyards, a premier wine grape grower, still has 30 percent of its fruit to pick, spanning close to 100 acres. "The jury is still out" as to whether the grapes will be tainted by the acrid smoke that has hung in the air since Monday, said Sam Coturri of Enterprise Vineyards. As a precaution, they have been washing grapes on their sorting tables before sending them to be crushed. It's not just the quality of the vintage that worries Coturri, but his employees, too. Enterprise Vineyards employs more than 100 full-time viticulture workers across wine country, but many have been unable to work. "Until a few hours ago, those vineyards were closed off by mandatory evacuations," Coturri said, adding, "This is the time of year that most of these families count on." In the town of Sonoma, 160-year-old Gundlach Bundschu Winery was rumored to have burned to the ground when the Patrick Fire tore down Mount Arrowhead on Monday morning. "My brother and I woke up to those reports," said Katie Bundschu, the winery's sales and marketing director. "It was pretty terrifying. That winery is our livelihood." The family's private residence was destroyed, but the winery and other buildings were spared thanks to the efforts of just six firefighters. "It could easily have been a different story because of the tenacity of the storm and the winds," Bundschu said, adding that the property is still "covered in ash."